There is a total of about 150 senior scientists and 200 doctoral students contributing to HAP. 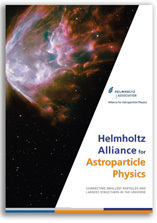 Astroparticle Theory is a ‘horizontal’ topic that generates interactions throughout all activities within the Alliance. We will develop a detailed and coherent description of Propagation and Detection of high-energy cosmic particles, which is the key to interprete observations in terms of astrophysical source models and parameters. Related to this topic is a better theoretical understanding of Particle Acceleration Sources themselves, also through computer simulations. The third point is about Dark Matter and Non-Acceleration Signatures and how to disentangle their fluxes of accelerated particles. The Non-Thermal Universe is an extensive topic that deals with virtually all cosmic particles like protons or heavier nuclei, gamma rays and neutrinos. Their coherent exploit of information is the aim of the Multi-messenger Astroparticle Physics work package, which is closely related to Cosmic Ray Composition and Interactions. In Novel Detection Technologies and Future Challenges we prepare the necessary tools for the large facilities that are required for the future progress of the field. The Dark Universe is composed of Dark Matter and Dark Energy, the latter being a working name for the cause of the accelerated expansion of the Universe. Dark Matter is more concrete and manifests itself in gravitational interaction. 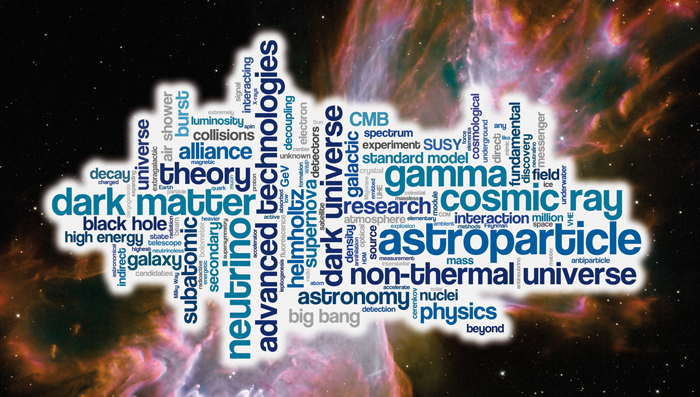 In two work packages we develop a coherent Analysis of Dark Matter searches and focus on the Key technologies for next-generation Dark Matter experiments. Advanced Technologies are described wherever they occur in the other topics. However, we want to give them the visibility of a topic on its own in order to foster the exchange of knowledge and expertise across the Alliance.